One of my goals this year is to take some astro pics of various things – moon, planets, stars, DSOs. While some people take shots of the sky with just their cameras, in my limited experience, there are four ways to capture images through a telescope. 4. Smartphone mounted at the eyepiece. When people talk about astrophotography (AP), they normally mean option 1 or 2. Option 1 is considered the best option by most amateurs, not because you get the best visuals, but just a combination of cost and quality. DSLRs are awesome machines with proven technology to capture photons. You can even get ones that have modified sensors explicitly to improve capturing night skies with limited light. Option 2, the webcam, is great if you can afford the high-end cameras but even the lowest end requires another piece of equipment — a laptop to capture what the webcam is seeing. Lots of people debate Option 1 and 2, and while you might get agreement that “technologically” the high-end webcams will produce better output, you’ll likely never get agreement on what is better or easier to work with for a given individual or at a given price-point. Option 3 for a point-and-shoot camera was created by people who wanted to take some photos but didn’t have a webcam/laptop or a DSLR. There are little adapters that you mount the camera on, hold it in place over the eyepiece, and bam, you can take a photo. It is, however, highly finicky to adjust everything and get in place to take a shot. I never had much luck with it myself, but I gave it a try, just as I tried the other two above as well. Some people found it just as easy to hold it steady above the EP as anything else. Option 4 — the smartphone — was basically a simple modification of Option 3 and has grown out of the desire of many people to do exactly what they are doing for regular photography instead of using DSLRs … take shots with the camera they already have on them rather than lugging something else. Early adopters simply held the smartphone up to the eyepiece, and snapped shots. I’ve done this myself, and got a couple of okay early shots of the moon, but anything else was beyond me. I just can’t hold it steady enough. I also don’t have the patience. Moderate adopters bought simple adapters that came out from various manufacturers and basically gives a series of little clamps to lock on to your phone in one part and an eye-piece in another. Sounds simple enough, but it’s misleading. For one thing, all phones are different sizes so the phone clamps have to be adjustable i.e. not exactly perfectly sized or lined up. Particularly because some phones put the camera in the corner of the back, others put it in the centre, others in the opposite corner, etc. So after you mount the phone to the adapter, you have to centre a mounting ring over your eyepiece to get it lined up (most newbies make the same mistakes I have done which is to try and centre the camera over the eyepiece rather than first centreing the eyepiece ring over the phone’s camera port, and then adding the EP last). Current adopters are excited by seeing some of the great work that is out there (like Andrew Symes’ on Twitter — @FailedProtostar) and seeing just what is possible. For these adopters, and to some extent the others, you quickly divide into two camps: iOS users and Android users. iOS — Those with recent iPhones are blessed with two things. First, the iPhone cameras are good, solid cameras. Are some of the new Google Pixel, or Samsung cameras better? Doesn’t matter, really, the point is that the iPhone cameras are good and have decent abilities to alter the options/settings since night-time photography at a telescope eyepiece is not your “default” setting for any common camera. However, they get a second benefit. There’s an app called Night Cap(ture). It exploits the benefits of the iPhone’s abilities to the max, and just about everyone who uses iPhone for night shots don’t even bother to try anything else. It’s the default go to app, and produces awesome results. Android — Within the Android world, all the cameras are different: some support API1, some API2; some have great cameras, some have good; some let you play with settings, some don’t; some will save in RAW, most won’t. But even without the variations in the hardware, there is no clear winner in the app world on the scale of Night Cap. If you go by popularity, probably Camera FV-5 comes the closest, and it has lots of power. Although it doesn’t include a video mode, that’s a separate app. Sigh. Anyway, the point is, it’s just not as robust or streamlined as the iOS option. Just about everyone out there who is doing AWESOME stuff out of the gate is using iPhone. Despite the larger Android market share, I would say “awesome smartphone AP” is about 90% iOS and 10% Android. Enough context, what am I doing? I tried webcam stuff, but it was something I pushed to the backburner after a few tries, with the intent to focus on visual observing until I felt that I had that well-covered. Five years later, I don’t have it nailed, although the alignment process is fixed. I tried DSLR and have all the parts, just haven’t quite nailed the process and setup yet, but again, put it to the backburner. The point-and-shoot option is still on my list once I nail smartphones as I would like at some point to take four images of the same thing(s) with all four just to show what I can get with a bit of practice and minimal skill. Which leaves me in the beginner’s AP world of snapping photos at the eyepiece with my Android phone running Camera FV-5. I tried a bunch of other apps, none were even close to giving me what I want on my Samsung Note 4. I can’t save in RAW, but I’m fine with JPGs. I’m aiming more for souvenir web photos than printing enlargements or giant murals. I’m getting a few shots, but nothing spectacular, and it’s hard to figure out where I need to make my improvements. There are x steps in the process. Mount the phone in the bracket. Adjust the phone to the right height and angle of the eyepiece ring. Find an object in the scope. Mount the eyepiece ring over the eyepiece, thus mounting the camera. Snap the photo or record the video. That sounds like it should be easy enough, right? Except here’s the deal. 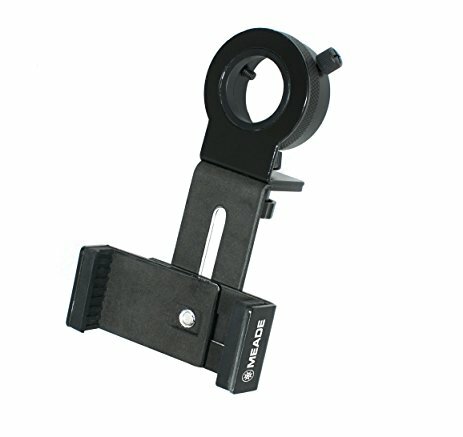 I have a Meade smartphone adapter and it basically consists of a “U-shaped” holder, you lie the phone flat in it, and then squeeze the U thinner to pinch the sides of the phone. A small screw knob (1) underneath tightens to hold it perfectly in place. Except there’s a small variance with the next step. Step two: Adjust the phone to the right height and angle of the eyepiece ring. So here’s the deal…the eyepiece ring has an inner bracket that clamps on to the eyepiece and an outer bracket that connects to the phone bracket. A screw knob (2) holds them together. To align the phone at the right height above where the eyepiece will be, you use screw knob 2 which allows the phone bracket to move up and down in height about half a centimeter. Screw knob 1, which holds the U together, also allows the horizontal phone to move forward / back and left / right in the bracket to allow it to centre itself over the eyepiece ring. I confess, this is NOT the next step in my process, but I’ll talk about that later. Usually, this is the normal next step. Pretty straightforward. Locate something in the scope that you want to image, put it in focus, get it tracking if you have a tracking scope. Again, this is not my usual order, but the standard one. With EP in the scope, and the camera phone mounted on the adapter, you then place the adapter on the eye-piece, tighten it up, and it’s installed. You hope. When you did your initial focus, it was to see the object in the EP. Now that you’ve got a camera a bit above the EP lens, you need to tweak your focus a bit. A friend uses a magnifying glass to make sure his stars are pinpoint sharp. Others eyeball it on the screen as they adjust the focus knob. If the camera isn’t already set for the right settings — infinity focus, duration and ISO — then you can set them now. With everything looking perfect on the screen, time to record the video or snap the photo. Since most phones will shake a bit when you touch them, lots of people use a 2 second timer delay for the shaking to stop or a remote trigger or even voice controls. I essentially swap steps three and four. Normally you use the EP to find an object and then mount the camera on top. In my case, I have an extra EP, so I first mount the EP I intend to use to the camera and THEN find an object with the other EP. When I am ready, I swap the EP+camera for the spotting EP. Just saves a few steps on the fly and increases the likelihood that my EP will stay attached. But it is hardly pinpoint and there is nothing showing around it? Seems odd to me. So I’m messing up somewhere in the seven steps to get from A to Z. Just not sure where yet. I’ll keep trying. So I posted earlier that my astro season has kicked off, and I’m good to go. With the news that Jupiter was in opposition this week (the closest it will come to Earth all year, hence LOOK NOW for your best view), I thought, “Well, yeah, I want to set up”. And because it’s a PLANET, not some dark sky object, I can do it from my backyard. So on Tuesday, I was in a hurry to setup before Venus disappeared behind a house, and I wanted to show my wife and son, so I set up the scope on our deck. Anyone who knows scopes knows a deck is a bad idea unless it’s cement. Otherwise they jiggle if anyone walks. Hard to get vibrations out, but whatever. Anyway, got it set up, quick solar system alignment on Venus, good to go, showed the family, all good. Then I did a quick sky tour, realigned on Procyon and Capella, not bad, and then I started doing a quick sky tour while I waited for Jupiter to come up over a house. Not awesome, but then again, I hadn’t done ANY OF THE PROPER ALIGNMENT THINGS I know I need to do. Did I put on the vibration suppression pads? No. Did I set up on actual ground and not a deck that bounces with every move? No. Did I put in my most accurate time, location, etc.? Nah, general ballpark. Did I level the scope? Nope. Did I choose two good stars fairly far apart in the sky with different altitudes? Nope. Did I do a careful alignment for RIGHT/UP? Yes! I’m not a neanderthal. Well, I mean, I didn’t do the proper doughnut thing to align or use a reticle, I just eyeballed it, but I did do RIGHT/UP at the end. Gee I can’t imagine why I didn’t have great alignment. If only I had a post where I could refer back and teach myself how to do it correctly. 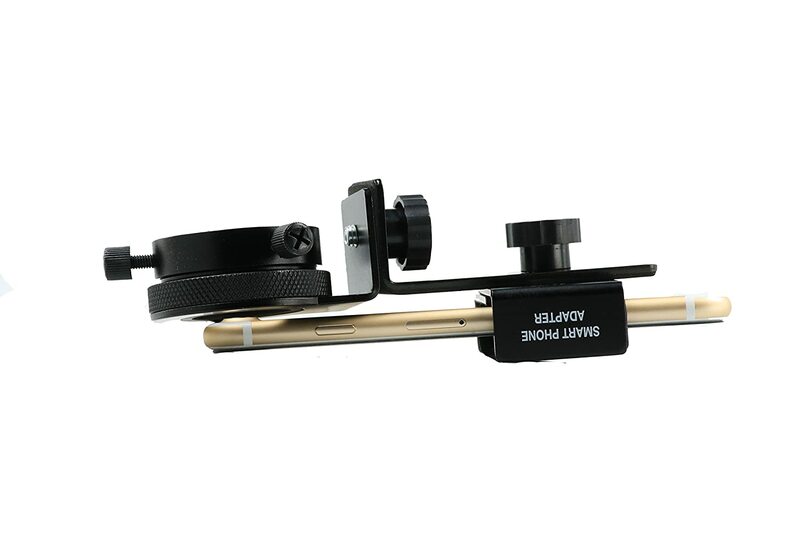 (Best alignment process for the Celestron NexStar 8SE). Stupid lazy git. Anyway, I really wanted to get to some astrophotography of Jupiter. Wasn’t awesome but got a white blob. Wasn’t really expecting anything. But it was promising enough that I started my “new project” anyway. I have my wife’s old iPhone, and everything I’ve read says iPhones tend to focus better on EPs than Android for their camera design, and the best software on the market seems to be Night Cap(ture) which is only available for iOS. So I decided I would repurpose the phone that is sitting unused, basically an iTouch / iPod at this point, and use it as my dedicated astro camera. I charged it enough to boot, and discovered I couldn’t go any further without a SIM card. What? I don’t want it as a phone, why do I need a SIM card???? Dang it. Researched ways to bypass, and while there are lots of sites that say you can do it, one of the FIRST steps they say is to borrow another SIM card. Umm, which part of “I DON’T HAVE A SIM CARD DON’T YOU UNDERSTAND?”, which is pretty much 75% of the comments on those articles too. Or I could jailbreak it. Or I could find the original SIM card. I called one of the repair places that fixed my tablet, talked to the tech, and he basically said any SIM card for an iPhone should work, and my wife DOES have a new one, soooo…anyway, I tried my Android SIM card first, no joy in Mudville. My wife’s sister had used the phone at one point for a camera on some trip, so she got it working somehow, and turns out she did have a/the card for it, but well, I was impatient. I popped out my wife’s card from her current iPhone, and guess what? They’re totally different sizes. Great. What the hell. I popped it in, and tried to put it in the card slot anyway. No way this should work. It doesn’t even “fit” in right…smaller than the old one. And the phone moved to the next step. While I held it in place, it let me activate the phone again, register with the app store, all of it. Then I put the SIM card back in my wife’s phone, rebooted, all good there too. Onward! Found the app store, connected to wifi, went to NIGHT CAP, tried to download, it needed a code from my wife’s account, annoying but manageable, all good to go. Then it tells me NIGHT CAP requires iOS version 10+. The iPhone 4S? Limited to v.7. No joy in mudville. I tried it in the scope on Wednesday night anyway, and the controls seem just too basic with the stock camera app. Can’t change ANY settings. Sigh. Okay, well then. On to the Android phone. The best app for the Android is apparently Camera FV-5. I downloaded it, got set up, mounted the Android phone, played with the layout and setup of the physical adapter to figure out the “best way” to align. Went out to the scope, and couldn’t see anything on the screen. Now I have a good option for this…often the problem is that the scope isn’t “focused” for that EP, and when you do get set up, you can’t go back to look through the EP as it’s now mounted to the phone. So the easy solution was to pick up two cheap EPs at the same magnitude as the other two I want to use…a 25mm and a 15mm. So I can focus with the first 25mm, get it lined up, and seeing “something”, and in the meantime, I can mount the second 25mm to the phone adapter. When I’m ready to take a pic, I just need to swap EPs in and out. I can do the same at the 15mm level if I ever get that good at the basics. White balance — when you do night shots of the sky using your DSLR, most of the astrophotography sites suggest the tungsten setting (good to get rid of flourescent light normally) as it balances things better. You might have to soften or adjust lighting afterwards, but a good option. Yet I’m not taking a shot of the night sky directly, this is a shot of the EYEPIECE basically. No idea what is the best setting, and my tweaks weren’t producing any noticeable improvements. Light metering — Which option to use for this is almost anyone’s guess…balanced across the image, focused on the dots that are the planets, moons and stars, or something else entirely? Focus — for DSLRs on the night sky, you generally want it at “infinity” to be in focus for star points. But this isn’t the sky, again, it is of the EYEPIECE that is basically millimeters from the camera. Do you go Auto? Macro? Infinity? As with metering and balance, tweaking wasn’t giving me any better results. I posted a question on Cloudy Nights in their Astrophotography area, but no guidance yet. So I said “screw it”, I’ll just do a bunch of visual observing. And hey, maybe I can try out the Ultrablock that is supposed to knock out man-made light pollution. If it does, I have no way of knowing. My alignment was so far off that at one point, I told it to go to Jupiter, and it pointed to a spot where Jupiter had been almost 90 minutes earlier! It had aligned previously, but then I changed something, replaced a star somewhere and obviously screwed up. Because when I told it to go to Jupiter, and it was off, I manually adjusted to Jupiter’s real location and told it to align again. It thought about it for about half a second and said, “Nope, that’s too big an adjustment for me, not going to do it, try again tomorrow, ya lazy git who didn’t bother to follow the right alignment procedure at the start!”. Okay, maybe the wording was something like “unable to adjust”, but that’s what it meant. Good thing the star party is tomorrow. I need to do some serious observing with the RIGHT alignment process from the start.